Add any three CE courses to your shopping cart and the lowest priced 3rd course will automatically deduct at checkout (courses must be purchased together, one free course per order). Have a coupon? Apply it at checkout for even greater savings. Offer valid on future orders only. Sale ends Oct 9, 2017. Click here to Buy 2 Courses & Get 1 FREE! 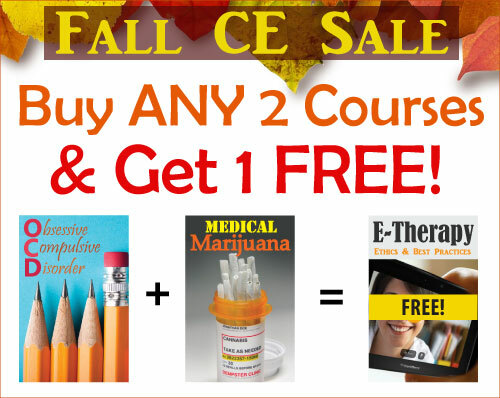 Our Fall CE Sale is here – buy any 2 CE courses and get a third for free! Have a coupon? Apply it at checkout for even greater savings! Add any three CE courses to your shopping cart and the lowest priced 3rd course will automatically deduct at checkout (courses must be purchased together, one free course per order). Offer valid on future orders only. Sale ends Oct 9, 2017. 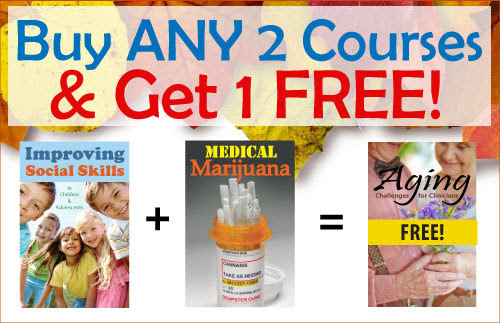 Click here to Buy 2 CE and Get 1 FREE!